Here’s a smaller painting that I just completed. 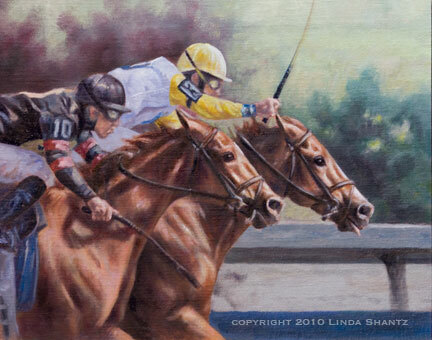 This is an 8 x 10 oil on Signature linen panel of the finish of the 2008 Queen’s Plate. Not Bourbon, on the inside, just held off the filly Ginger Brew to win the mile and a quarter classic in a thrilling stretch duel. I’m pretty sure it was probably his tongue sticking out that made the difference! This painting is available for sale. If you’re interested, drop me an email!